Including: The Borden Tragedy, The Mystery of Mary Rogers, The Saga of the Bloody Benders, The Case of Madeleine Smith, The Murder of Abraham Lincoln. This is an engrossing, illustrated journey into true crime classics of the Victorian era. 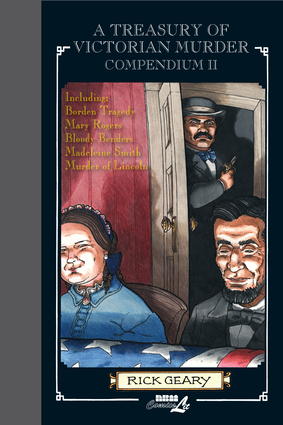 This second omnibus of storied treasuries of murder includes the famous double axe murder by Lizzie Borden; the mysterious drowning of the lovely Mary Rogers; the Bloody Benders, a family of murderous inn keepers; socialite Madeleine Smith who poisoned an inconvenient suitor; and the famous assassination of President Lincoln. Each true crime story includes a bibliography of research sources, presenting true facts about famous murders in an entertaining fashion. Rick Geary is an award-winning cartoonist and illustrator. He has worked for Marvel Entertainment Group, DC Comics, Dark Horse Comics, and Heavy Metal magazine, and has contributed to National Lampoon and the New York Times Book Review. He lives in Carrizozo, New Mexico.